Elegant Italian design, figure- hugging, floor length fish tail gown. Hand -beaded silk bodice and dress. Hand -beaded imported French Lace tiered train. Very low back, beaded shoe- string halter top. Classic and timeless. Makes a statement! Very WOW! Simple, floor length comb- attach train included. Bargain price!! NEEDS TO SELL. Excellent condition in original box. 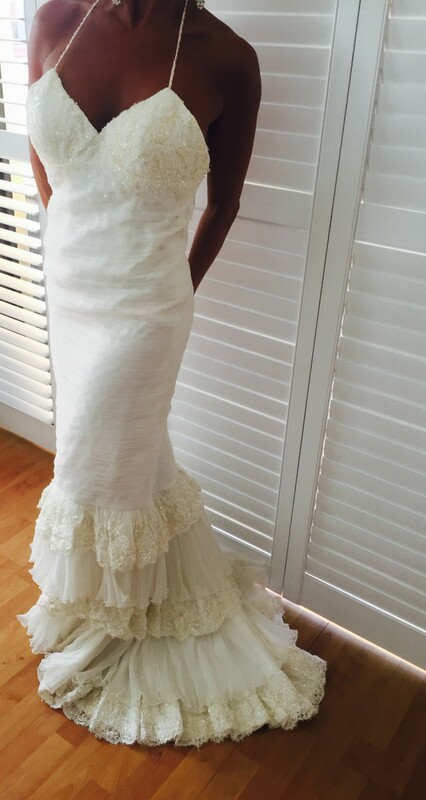 Once you send a message, Oonagh can invite you to purchase the dress.